Germany's justice minister has condemned violent clashes at the Group of 20 summit in Hamburg that have injured 160 police officers and led to the detention of more than 40 protesters. 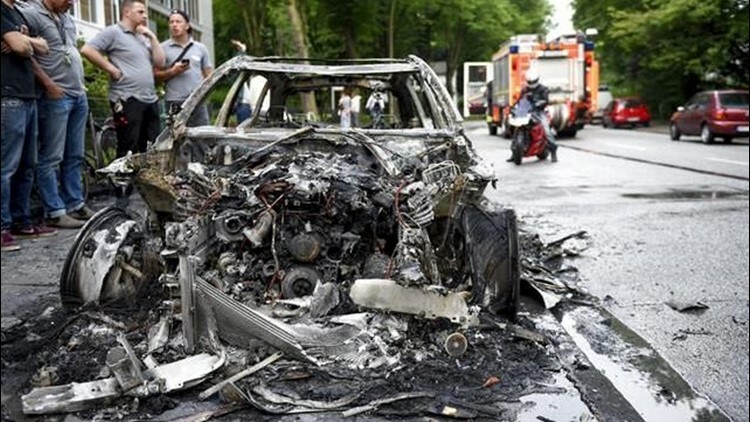 HAMBURG, Germany (AP) — Germany's justice minister has condemned violent clashes at the Group of 20 summit in Hamburg that have injured 160 police officers and led to the detention of more than 40 protesters. Maas said, "Every peaceful protest is welcome. But that is no free pass for unrestrained rampage." The minister added that, "these extremist criminals don't belong in the streets, but into court. Whoever torches cars and injures police officers does not deserve any kind of tolerance." Russia's President Vladimir Putin is calling for a careful and pragmatic approach in tackling tensions over North Korea. He noted that while the problem linked with Pyongyang's nuclear and missile programs is "very acute," it's "important not to lose self-control and act in a pragmatic, very accurate way." The South Korean president emphasized that "the North Korean missile provocation has become a threat to the entire region." President Donald Trump was on the far left at the Group of 20 summit — in the leaders' group photo, that is. Trump's position as an outlier was merely a matter of protocol. Pride of place goes to the so-called G20 troika, consisting of current host German Chancellor Angela Merkel flanked by the host of the next meeting, Argentina's Mauricio Macri, and the host of the last one, China's Xi Jinping. German Chancellor Angela Merkel has told Group of 20 leaders that millions of people are hoping that they can help solve the world's problems. Merkel said Friday she's sure that every leader will make an effort to achieve "good results." But she added that "solutions can only be found if we are ready to compromise." All the same, Merkel said that leaders also should name their differences. Merkel was speaking at the start of a working lunch at which leaders will discuss global growth and trade. Pope Francis said that "in the hearts and minds of leaders and in every phase of taking political measures, it is necessary to give absolute priority to the poor, refugees, those suffering, the displaced, those excluded, without national, racial, religious or cultural distinction." The pope also urged leaders to reject armed conflict, urging an end to "useless massacres." The goal of the G-20, the pope noted, "is to peacefully resolve economic differences." Francis said that the leaders should "move to deep reflection" on the fact that the summit brings together 20 nations that represent 90 percent of the production of goods and services in the world, while those who suffer the most are less represented on the world stage. Putin said Russia will issue a call to "jointly neutralize political, economic, social and ideological conditions allowing the expansion of terrorism." He added that "no nation can deal with this evil on its own and offer a reliable protection to its citizens." In a communique following their meeting in Hamburg early Friday, the BRICS leaders voiced support for a "rules-based, transparent, non-discriminatory, open and inclusive multilateral trading system." They emphasized the need for increasing "the voice and representation" of the emerging markets and developing countries in global economic and financial institutions. The meeting at the city's trade fair center opens Friday with a discussion on fighting terrorism — one of the least contentious subjects on an agenda that also includes global trade and climate. The G-20 comprises Argentina, Australia, Brazil, China, Germany, France, Britain, India, Indonesia, Italy, Japan, Canada, South Korea, Mexico, Russia, Saudi Arabia, South Africa, Turkey, the United States and the European Union. Saudi Arabia's King Salman isn't attending, and his country is represented by Ibrahim al-Assaf, the minister of state. The host, German Chancellor Angela Merkel, says she hopes to find "compromises and answers" on a range of issues at the two-day meeting of leading economic powers opening Friday. While there's little disagreement on fighting terrorism, prospects of finding common ground on climate change and trade look uncertain. The meeting opens after skirmishes Thursday evening between police and violent protesters elsewhere in the port city, Germany's second-biggest. Police said that at least 76 officers were hurt, one of whom had to be taken to a hospital with an eye injury after a firework exploded in front of him.